Register, enter your patient details and buy the test you need. The entire process is secure and we do not store your payment details. We will send you the test kit and you should receive it the next day. Follow the easy to understand instructions and post your sample back to us using the reply-paid envelope. Our laboratory tests your sample and places the results on a secure log in area which can only be accessed by you. If you allow us, we will even send you a text message to let you know as soon as the test is completed. Log in to our website to view your test results. This is to ensure complete confidentiality and is much safer than receiving your results by email. All tests ordered online by 5 pm Monday to Friday will be dispatched that day. We have the option of first class or guaranteed next day delivery. 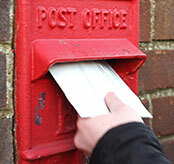 We include a business reply envelope to make returning your sample as easy as possible. Samples are processed round the clock at the lab and most results are available within 24 hours. If you require treatment, you should have it the next day. We are the only online service providing this fast, one-stop solution. If you have used our service before, all you need to do is login to your account and select the type of test that you would like. Pay with your card and we will despatch the testing kit immediately. If you have any problems or concerns then you can call our helpline on 020 7125 0367. Someone will be happy to assist you.